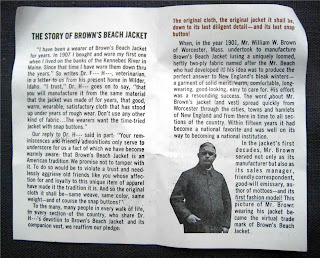 With the nighttime temps here in Southern California dipping down into the forties this past week, I have had the golden opportunity to break out my much loved but rarely worn Brown's Beach Jacket. 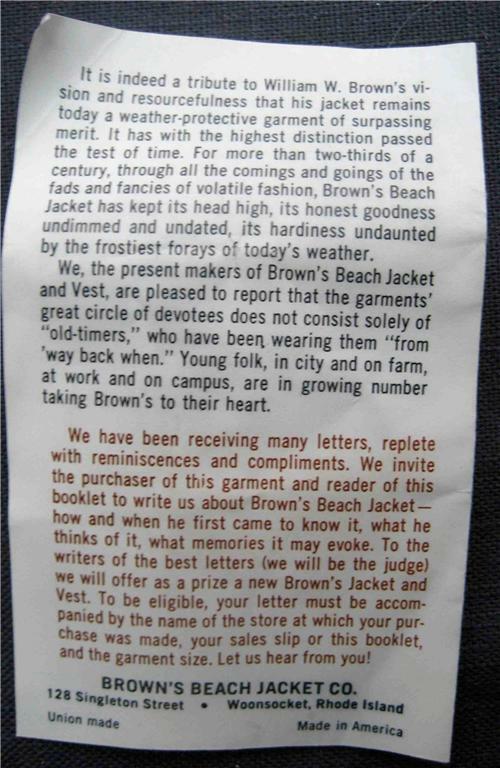 This inspired me to share some photos my vintage Brown's Beach Jackets, Vests and few print ads from the collection. 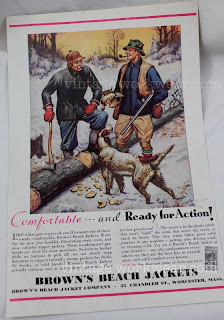 Also included are two vests and a jacket that we recently sold via The San Fernando Valley Mercantile and a couple of nice Japanese reproduction pieces. Enjoy! 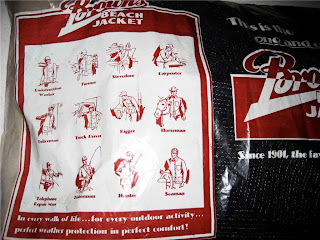 Discovered these great jackets back around 2004 while searching for information on salt & pepper vintage workwear and gained a bit of an education while trying to find one in a larger size. 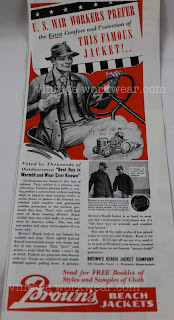 Thanks to JD for the information and photos early on & RL for the BIG hook up back in 2007, another pivotal vintage workwear moment. My new old stock 2 pocket zipper model with original hang tag and inspection tag. I believe this model is known as a Surcoat. It cost more than the shorter button front version due in part to it's longer length and leather pocket detailing. 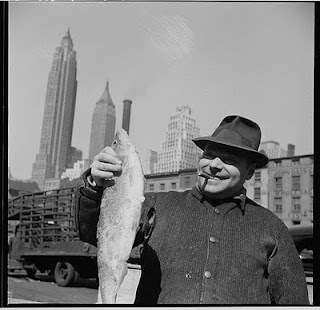 1943 - A man, his beat-up Brown's Beach Jacket and a large fish. It's a great day!! 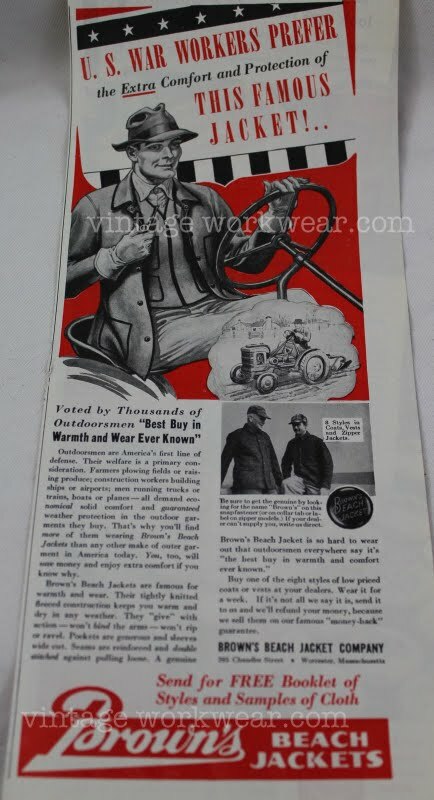 Vintage 1940's Brown's Beach collarless jacket with oversized snaps. Vintage Brown's Beach Vest size 42. 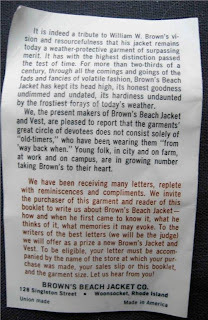 Sold via The San Fernando Valley Mercantile Co.
Vintage Brown's Beach Vest size 46. Sold via The San Fernando Valley Mercantile Co. 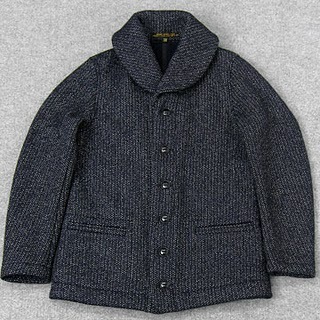 Fantastic Shawl Collar Japanese reproduction. Guess I'm kind of glad it wasn't made in larger sizes, I would of had to have it. Recently ran across these Reproduction Brown's Beach "Shelter Caps" over at the WILD ONE. So great to see all this together! 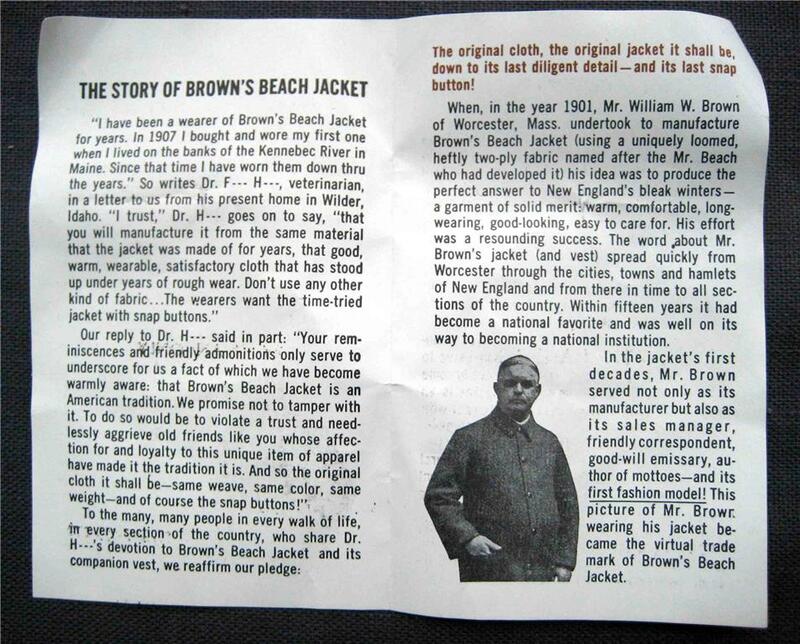 Nothing quite compares to the utilitarian beauty of a Brown's Beach Jacket. 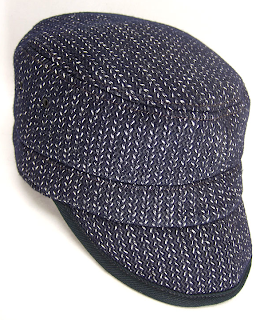 Essential for any great vintage collection. 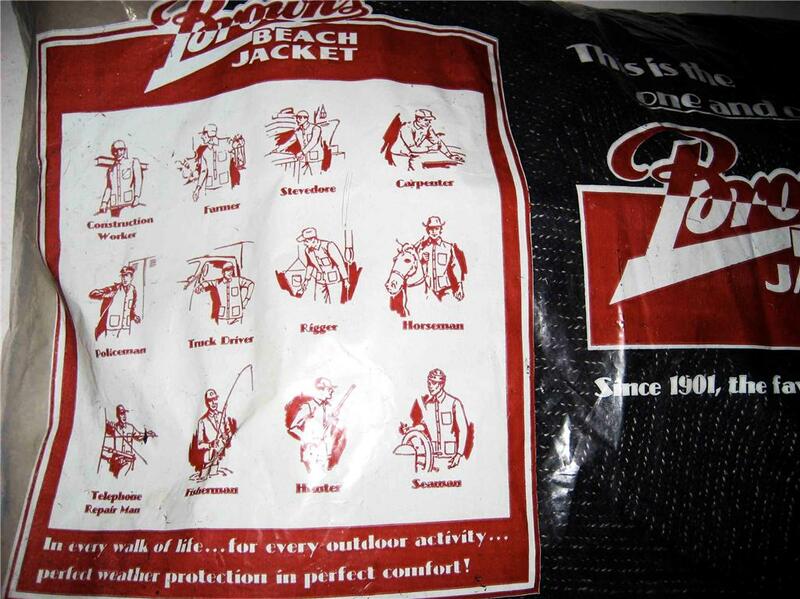 In the 1960's, J. Finkelstein and Sons in Woonsocket RI produced the Brown's Beach Jacket and Vest. what is the value of these? 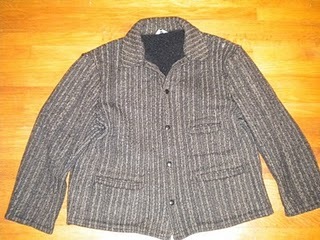 I have a vintage mens small jacket in mint condition-virtually never worn. 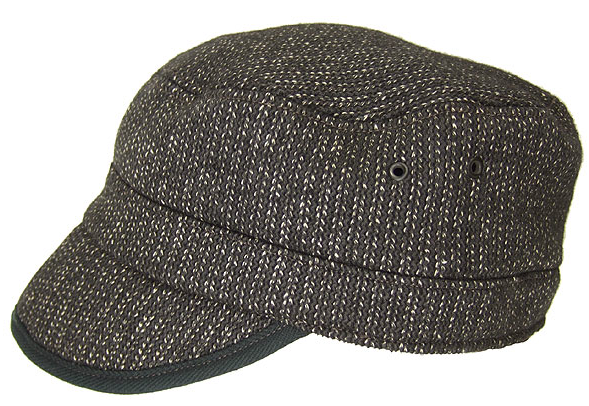 Salt and pepper with 2 pockets, broad collar. Gorgeous jacket.